Because nobody’s perfect. Because when you mess around with stuff and experiment, sometimes it just doesn’t work. These are the yarns I don’t post on my page! And trust me, I made a couple this last week already. It occured to me today that if I only ever show people my non-fail yarns, it might actually look like I am just always on a roll, and even now, as I write this, I am wondering if I actually am going to post pics of my total mess-up yarns. Ok there is time to decide before I finish writing. The point is, if no one ever posts their fails it can be misleading, and potentially produce feelings of inadequacy in viewers. You know, when you visit someones fiber love page and you see all the amazing things they make and you think ‘wow, I could never do that’ and you feel your creativity sink out the bottom of your thick soled Doc Martins and your inspiration takes a flying leap from the nearest water tower. All hope, at this point, seems utterly lost, because they are just so, perfect. The thing is, and I am pretty sure of this, no one can do any of this and have wonderful yarn every time. Unless they perhaps do the same thing all the time anyway. Then I guess the chances are fairly high that their stuff is always going to be amazing.. but okay, thats not what I am talking about. I mean that when you want to grow, to open the windows and let in the light, you need to take some risks and try things out. Sometimes you have this idea in your head and you are sure its going to go one way (the way you want) but when you try it out, even though the theory was great, you find that actually. No. It doesnt really do anything that you hoped and there you have it, a yarn fail. Some people might consider that there is no such thing as yarn fail. That in the world of ‘art’ yarns, there are no wrong answers. So ok, here is an example from this week. I have been playing around with different kinds of silk, previously having some fun experimenting with wrapping the fibers around a coiled yarn (in the Shelob Yarn which wasn’t a fail and ended up on the Majacraft blog), and I wanted to take this further and see what else I could do. Maybe that was the day when creativity had left the building, but it seemed that no matter what I tried it just didnt work out into anything pretty, or even useful. So I gave up on wrapping loose silk fibers and went for spinning a nice single from some silk top, it was pretty, but could I leave it alone? Nope, I wanted to see how it looked coiled. So I did that, two kinds of coils, fast coils and the kind of coils you push up the core to really compact them. This is actually really pretty done with silk! If you are trying it too, then this is actually the point where you should stop. Just. Stop. Because then I thought, hmm, I wonder what this would look like plied with something rough and lockish.. I had some bfl nearby… made another very roughly spun single and plied this into an nply of the coiled silk. Hmm. It pretty much looked like I already thought it might look, only I hadnt anticipated that it would look so bad! So what did I do? Added a wrap of MORE bfl… I dont actually know why I did this anymore, but I was clearly past the point of no return so, why not do what I usually do in a losing situation and compound the whole problem by just not knowing when to leave it alone! I ended up with a not very long, but very thick yarn, which I about gave up on at this point, took off the bobbin, and plyed it by hand around itself one more time and joined the ends, in the vague but futile hope that it might look somewhat ok as a necklace. Why am I telling you all this? Because I want you to remember that everyone has fails, feelings of inadequacy, and makes things that they are totally less than proud of. BUT, this is also (at least in my mind) an incredibly vital part of innovation and experimentation. If you never fail you never learn anything either. In the PROCESS of making even a fail yarn, you make discoveries, like ‘these colours work’ or ‘if I stopped here it would have worked better’ or ‘I just need a different kind of fiber’. This is the rule I live by; just do it, and trust yourself to deal with whatever mistakes you might make on the way. I even have a ring that Ive worn for about three years with this engraved in it: trust yourself. When you feel inadequate or untalented at the end of your latest yarn fail, when you are looking at other peoples ‘perfect’ yarns and thinking they are also perfect (and you aren’t), remember to trust yourself, one fail does not mean all future attempts will also be fails, it just means you are innovative, curious, and unique. Remind yourself that no one is perfect all the time. I made this post because I think its important to know this, and to see that it happens to everyone, too often we want to just show the good stuff, and make it ‘look’ like we never fail, when the truth is, if you’re ever trying anything new, its rare that it works perfectly first time. Trust yourself enough to try again! Now if you’d put this “failed”yarn around a wrapped present for someones’ birthday, it would look superb! And the recipient would feel quite chuffed about getting the woolwench original treatment, cause there sure would never be another yarn like it. We have a working sketch on newspaper print from an artist friend on our wall, full of “wrong” lines, yet lovingly framed by us. We can’t afford his big works, worth a few thousand, but this one went for $10 for charity, and we are proud to display one of his works. Sometimes its’ all in the eyes of the beholder. its that old story isnt it, if you dont make mistakes you can never learn anything! You are such a lovely person to share your booboo’s with us to let us know we are not alone in experimentation and… yes… some failures. It is all part of learning, growing and part of creativity. Love this post! When I was considerably younger I used to beat myself up when I had things go not as expected in craft projects (sewing/patchwork, crocheting and knitting) . Nowadays I treat all disasters as learning experiences…so it’s more about how you handle what appeared to be a failure rather than the disaster itself! 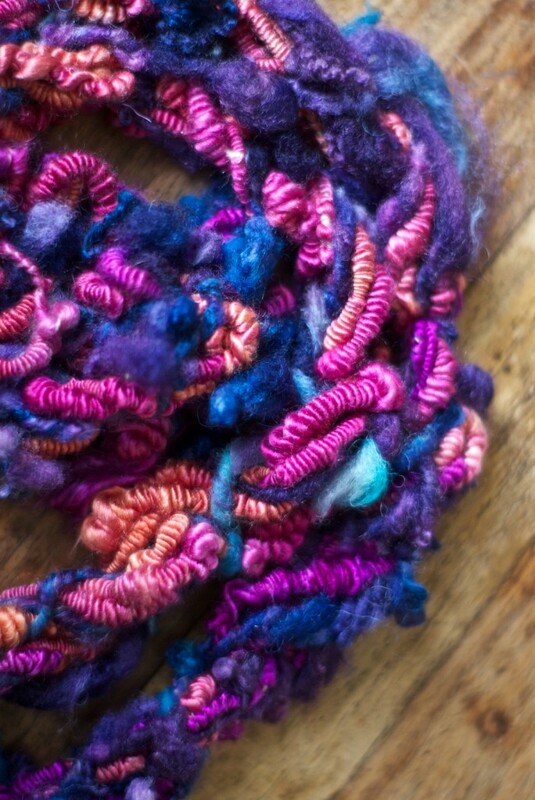 Love the colours in your yarn in the photo! Thanks so much for sharing! Recently I had someone tell me how everything I do turns out great. lol I told her, not so, she just didn’t see the things that didn’t work. One has to be willing to take a risk, try something new. True sometimes it just doesn’t work, but finding that out can be so exciting! ove the color combo and teh different texture looks really good. Just I would not know what to do with it, maybe hang it on the wall as decoration? Or atop a curtain maybe? Or you can use it for the end?? I know you will come up with something. Just let it sit there for a while and ideas will come to you. I know I do that when something just does not come up as I wanted it.